Across the world, Jill and Joe Wilkins watched news reports on the destruction in Haiti. Like all Americans they were deeply saddened by the event, but they were also personally affected by it. They had been waiting to adopt a little boy, and they did not know if he had survived. For a full day, they watched the news and prayed that their little boy was safe. A week later, Samuel boarded his first airplane. Although he was too young to fully grasp the significance of the plane, he was certainly old enough to find it fascinating. That plane carried him and other young survivors across an ocean to the families that were waiting to love them. Four years later, on the anniversary of the Haitian earthquake, Samuel’s new life is very different from the one he lived in Haiti. He lives with his adoptive parents and two siblings in Beaverton, Oregon. Now five-and-a-half, Sam is a happy, healthy little boy who loves – you guessed it – jets! Every time he looks out his parents’ window and sees a jet fly by, he stares with amazement. 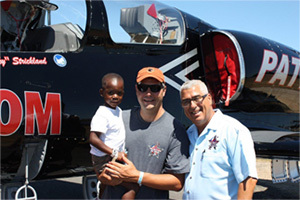 Sam’s parents, who are avid aviation enthusiasts, are eager to encourage Sam’s interest in planes and jets. They brought him to the Oregon Air Show in the summer of 2013, and that’s when we first had a chance to meet him. An enthusiastic fan, Sam’s huge smile was infectious. There were grins all around while Sam met our pilots and toured our jets. In fact, we all had such a good time it was hard to tell who enjoyed the meeting more – Sam, or our PJT pilots. There is nothing more rewarding to our pilots and the whole team than to encourage young people to pursue careers in aviation. We hope that Sam will always keep his fascination and love for jets, and that someday we will see him in the sky! Good luck, Sam, and thanks for sharing that wonderful smile with us. To learn more about the Patriots Jet Team or the Oregon Air Show, please visit our website at patriotsjetteam.com.